Albuquerque's Hotel Andaluz was the setting for the most recent Boerigter Breakfast Program featuring guest speaker Colonel Eric Froehlich, base commander of Kirtland Air Force Base. Col. Froehlich outlined KAFB's mission and shared his thoughts about the style, expertise, and techniques needed to lead such a large enterprise, touching on the base's economic impact on Albuquerque, core values, and why men and women choose to serve. 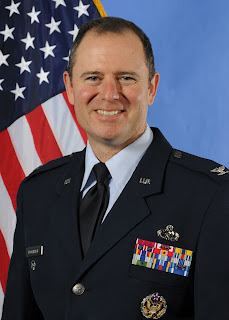 Col. Froehlich took command of the 377th Air Base Wing in May 2015, leading a 52,000 acre base that is the location of 23,000 military and civilian employees housing a variety of complex military missions, as well as Sandia National Laboratories and other elements of the Department of Energy. UNM Anderson hosts the Boerigter Business Breakfast Program to present relevant topics of interest to Anderson's community of friends. The UNM Anderson Boerigter Business Breakfast Program is sponsored by the Anderson School and made possible by the generosity of George and Sibilla Boerigter and SoundOff Signal.